WW1 Reenactments Equipment : Great War Tommy WW1 Documents, Paperwork : Canadian Y.M.C.A. Active Service stationery. WW1 Reproductions and WW1 Reenactors Equipment / Kit - Canadian Y.M.C.A. Active Service stationery. Canadian Y.M.C.A. Active Service stationery. 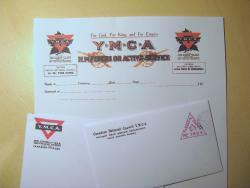 2 different replica envelopes and 2 replica headed writing sheets for the Y.M.C.A and The Canadian War Contingent Association, on Active Service. "For God, For King and For Empire"